Raging Justice is the debut title from MakinGames Ltd, with the publishing power of Team 17 they hope to reignite the flame that had been left to smoulder from Streets of Rage. 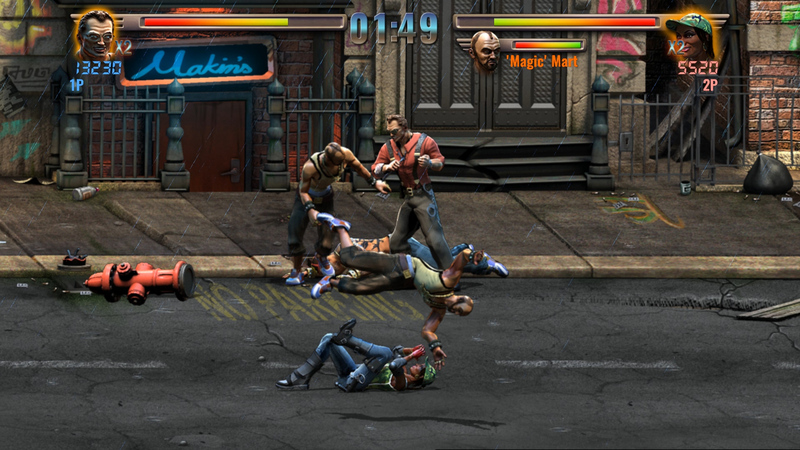 Is this a worthy successor or just another recycled enemy in the reemergence of Scrolling Beat em ups? Read on to find out. Raging Justice as mentioned has it’s roots firmly in the Scrolling Beat Em Up genre/Side Scroller/Fighting Game/Whatever you want to call it. For anyone unfamiliar with the genre, the game usually entails walking from one side of the screen, to the other, punching baddies in the face, fantastic stuff. Raging Justice is set in the crime riddled streets of Big Smoke City, overseen by the mysterious crimelord. Tired of seeing the streets riddled with filth, Rick Justice, his partner Nikki Rage & child of justice Ashley King set to the streets to punch crime in it’s gritty face!. The story in Raging Justice is late 80’s to mid 90’s action junk, it helps set the outlandish action tone of the game and fits the genre perfectly, it’s paper thin but the games it draws inspiration from aren’t exactly story telling giants. Overall it works well for the game and gives you that small enough reason to be kicking justice down bad guys throats. Visually it’s hard not to talk about Raging Justice, once again it wears it’s inspiration on it’s sleeve and employs the Pit Fighter/Mortal Kombat kind of art style, fortunately smoother than back in the day!. On the games initial reveal I found this style to look quite janky and unappealing, upon playing the game I can confirm it actually works so well, it’s buttery smooth & adds a level of grit to the game aswell as enforcing it’s 80/90’s roots. The character designs are somewhat of a mixed bag, general grunts and some of the bosses have fine designs, it does seem the ideas start to wear thin quick though as bosses start to look like juiced up muscle men with small heads. This also get more apparent the further you get into the game as new enemies stop appearing before the halfway mark and you fight armies of recycled baddies. 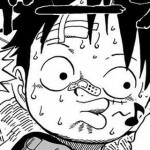 On the audio side of things we hit our first bump in the road of justice, the soundtrack is really unremarkable. An unfortunate side effect of being part of the genre means your soundtrack will have to compare to the fantastic Streets of Rage 2, outside of the title track which just about makes a stand, nothing registers, everything is just generic. The voice effects in Raging Justice are also bad but this time purposely helping to add to that arcade 90’s feel of the game, Rick Justice does sound a little “off” but considering the day he’s going through I can let him pass!. 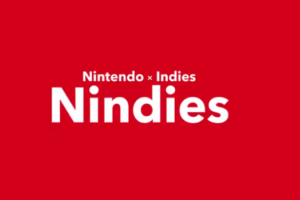 Now we are hitting the criminal underbelly of this title, the gameplay, this is where it all goes down & I am happy to say that in this case, that’s a good thing. 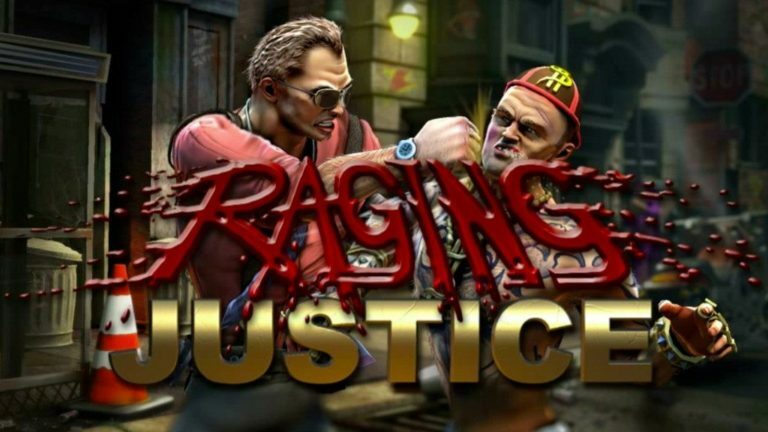 As mentioned earlier Raging Justice is a Scrolling Beat Em Up, fortunately for me, I love the genre, this also means I’ve played more than my fair share of them, Raging Justice is infact one of the better ones I’ve played but not without it’s weak points sadly. First off the combat in the game feels fantastic, visceral and responsive, this for me is one of the most important things to get right, if you’re gonna spend all your time punching people it needs to feel right, here it does. You have 3 characters to choose from, each with different stats and slightly different playstyles. It did knock it for me that there isn’t a “Large” character to pick I.E Max or Haggar, there is a character similar to Skate & lets face it, everyone wanted to play as him!. The game features 9 stages and within them stages there are several bonus objectives for you to tackle, they are a wonderful incentive for a replay & a welcome feature for the genre. One thing that did strike me with the stage designs was that there was no section on a train/bus/elevator, this threw me off somewhat as it’s pretty much a staple of the genre. There are “Pit Fight” sections in a few of the stages though and they brilliantly break up the task of walking to the right. Raging Justice also features a Good Cop/Bad Cop system, during the stages you can stun characters and choose to arrest them or Weapon K,O them, arrest gives you health, K.O gives you points, it’s risk vs reward at it’s finest & it also changes the ending depending on which side of the desk you are sitting on. The game has 3 difficulties and even on it’s lowest “Wimp” you’ll chip away at your credits. One of the main annoyances regarding the difficulty for me was the lack of invincibility upon wake up, especially on sections where motorbikes are crossing the screen relentlessly, it’s not offputtingly hard but it does feel cheap at times. 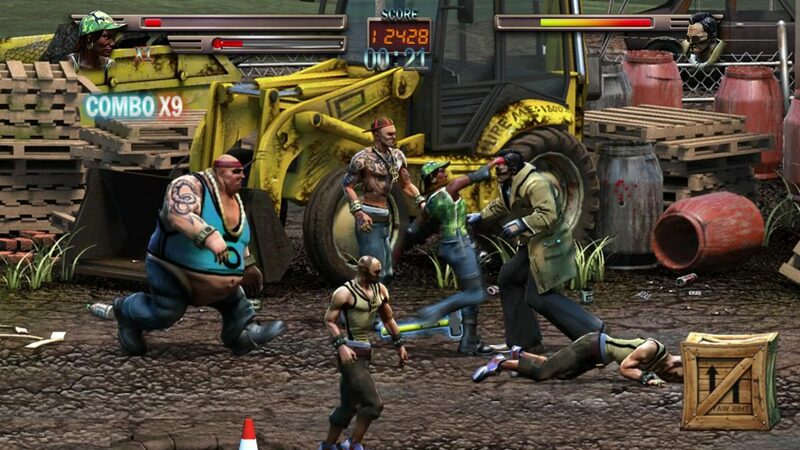 Raging Justice also features “Brawl” mode which is your standard survival mode, local Co-Op & online leaderboards. As addictive as getting the highest score on the stages is, this doesn’t make up for the lack of online Co-Op which really puts a dent in the whole package. Overall I really enjoyed Raging Justice, it was a nice 90’s arcade throwback which possibly could of ramped up the arcade touches a little more, extra sayings when using weapons, daft sound effects, the whole shebang. As a fan of the genre I can easily suggest fans look at this title, if you aren’t a fan of the genre then nothing here will change your mind, it’s got a fantastic price point and genuinely a great multiplayer game. 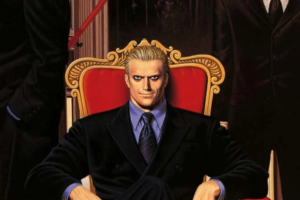 It’s a great time to be a fan of the Beat em Up genre with titles such as Gekido, Streets of Red & now Raging Justice doing the rounds, if you miss games like Streets of Rage & Final Fight do yourself a favor, pop down the Precinct and give ol’ Rick Justice a shout!